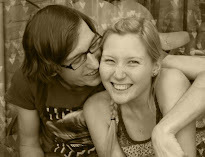 This blog will be about all the things I like such as cats, bjd's, designer toys and the best boyfriend ever. 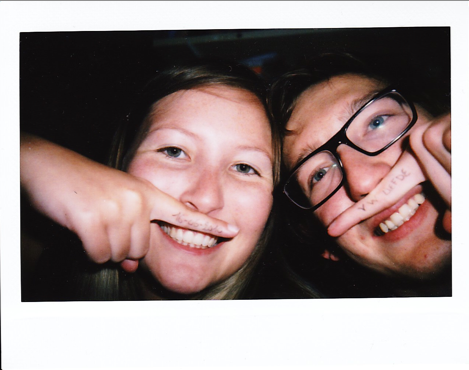 An Instax a Month #5 and #6! 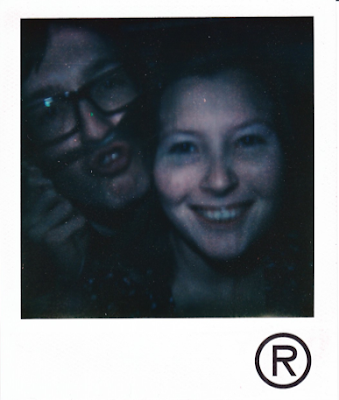 So, because the instax photo of May is playing hide and seek, I choose this polaroid photo instead. A crazy instax for June. On my finger it says: 16-06-2010 and on Wouter's finger it says: VW liefde (love). 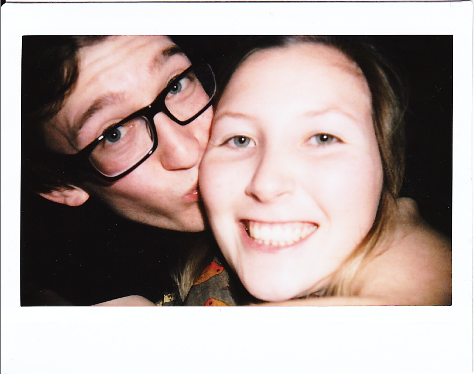 I'm really in love with this instax (although I hate how my hair is in it), but it's just so typically us. It really shows who we are. Yes, me and the blog are still alive. I think the last post was somewhere in April. I didn't forgot about the blog, not at all actually. I'm thinking about posting everyday, but there was just so much going on lately that I couldn't find the time to post. - April 30th I started working. I had a week of training and after that the real work started. I'm now a Call Agent. Never thought this would be my job, but well, it will probably be only temporarily for me cause I will keep on searching for a job that fits me more. - May 12th we left on vacation to Djerba. It was wonderful! I will be posting some photo's later on (be prepared for lots of photo's). We had a great time together and I miss it like crazy! I will try to post more often and I will try to plan my posts ahead. We'll see how things will turn out, but I promise I won't disappear for a months again. Music on Monday: Fun. ft. Janelle Monáe! This will be a review about an ice cream flavor of Ben & Jerry's I just tried. But let me tell you something about my experience with Ben & Jerry's first. Couple of years ago, I tried my very first Ben & Jerry flavor. And believe me, it was love at first bite! Yes, bite. It was a coconut ice cream with big chunks of chocolate and whole almond nuts (sorry, totally forget it's name). It was delicious! Even beyond delicious! The only Ben & Jerry store in Belgium at that time was in Antwerp, which is an hour drive from here. So every time we went to Antwerp, I made sure to stop at that place. I even asked to go to Antwerp, just to have that ice cream. But one day, without a single warning, they stopped making that flavor. At first I was hopeful it would come back, but it never did. I was so disappointed. Every time I went inside just to check if they had it, but they never did. I tried some other flavors of them, but never came across another one I really liked. And a couple of months after they removed that delicious flavor, even the store disappeared. So after that, I only tried Ben & Jerry's like 3 more times I think, but I just never really liked a flavor anymore. Until today! Which brings me to this review. Today I went to the new supermarket just couple of street from where I live. I came across a fridge stuffed with Ben & Jerry's and I started looking at all those flavors. Just reading their names and ingredients. At the very bottom shelf pushed away in the corner, there was a flavor I never saw before, called Baked Alaska. I started reading the ingredients and to my surprise it sounded really good. The ingredients are: vanilla ice, marshmallow swirls and white chocolate polar bears. I was kind of curious after reading this and bought it. And here we are, just after tasting a couple of little spoons. It was DELICIOUS! Really! I'm so happy I finally love a Ben & Jerry flavor again! The vanilla ice is very creamy and tasted so good. But the best part was definitely those white chocolate polar bears! I actually thought it would be just little pieces of white chocolate, but they were really in polar bear shape and bigger then I thought! They tasted quite sweet which perfectly blended with that creamy vanilla ice and they were very crunchy which gave the ice cream a lovely texture. But you actually don't taste the marshmallow swirls. You can see them (there are some extra white swirls in the ice cream) but you don't really taste them. But that's ok, I didn't really missed them. So I'm definitely going to buy this flavor some more and hopefully they will keep producing this flavor! And did I already told you it's a fair trade product? The money goes to Ben & Jerry's Climate Changes College, to stop the melting of the icebergs in Alaska. So that can be your extra reason to buy it, or to buy many of them. This planner is so adorable! I really need a planner or calendar or something cause my life is kind of becoming really busy. I would never have guessed this is actually a romper until I saw the picture of the back. It's just awesome! And that print is so cute too. This ship reminds me of that pirate ship from Peter Pan. I have absolutely no idea if a two-finger ring is comfortable to wear, but this one is AWESOME! This mug is so cute and it's yellow! Just perfect! This lamp is amazing!!! Just really perfect! 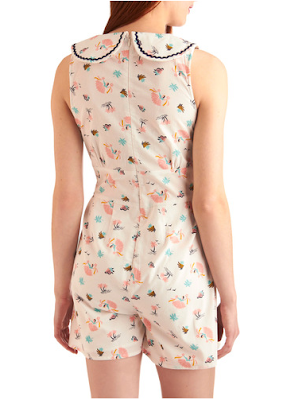 This bathing suit looks so adorable. The colors look great together. Amazing that this is actually a camera! It's so little, it would fit in anything so great if you go on a holiday. Yes, I am kind of a geek sometimes. And yes, I love wearing knee high socks. And the colors are nice too. So, I think everybody understands that I need (yes, NEED) these. This dress is so elegant. Ever since I was a little kid I loved dresses with eyelet embroidery. Please do NOT use any content without crediting me. Thank you.